Help Choose Great American Beer Bars. Vote Here. CraftBeer.com recently asked readers to nominate their favorite craft beer bars in the country, and received more than 5,000 nominations. We’ve now narrowed down the choices to the top 10 most nominated bars in each of five regions of the country (see below). Now we’re asking you to help choose the winners. You may vote for one bar from each of the designated regions. The top three craft beer establishments from each region will be recognized, as well as the top three national winners. 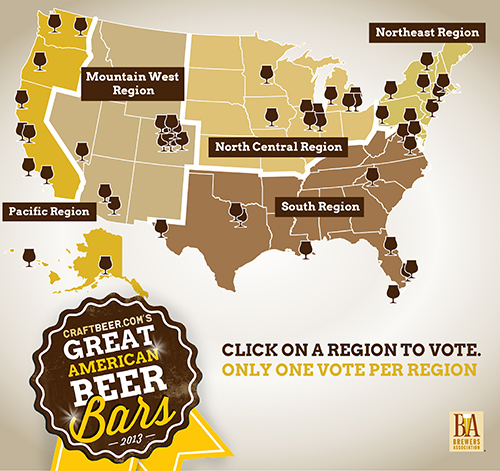 Almost 30,000 votes were cast in the inaugural 2012 Great American Beer Bars search, see the 2012 press release. Voting ends Friday, Aug. 30 at 11:59 p.m. MT.